If you are health conscious, you’ve probably tried or are currently trying the ketogenic diet (keto diet) and loving it. The one thing that I like about going keto is that it doesn’t force you to ignore your sweet tooth. If you’re anything like me, you have a big one! You might find that when your body enters ketosis, you may not crave sugar as much but, I know I did when I was keto. 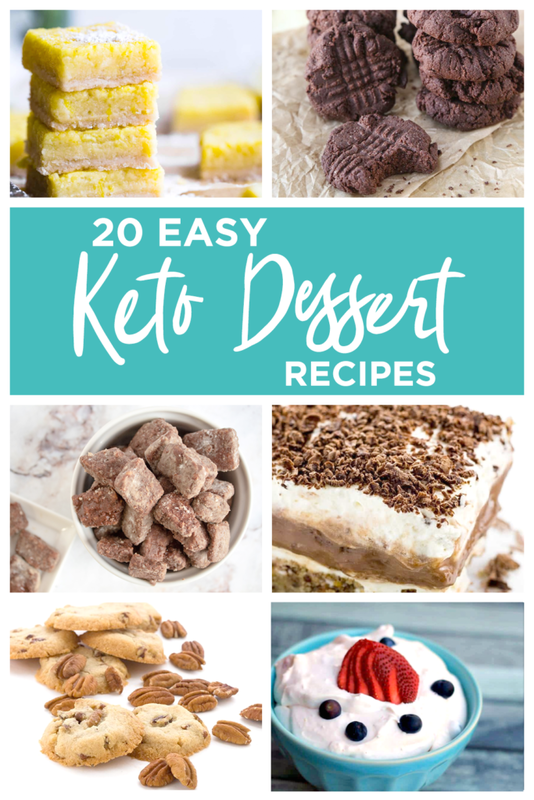 I’ve gathered 20 super easy keto dessert recipes that you’ll love! When you’re on keto, deprivation isn’t really a thing. That’s the beauty of the diet. What most consider “healthy” desserts usually include fruits but, most fruits are negative when it comes to following this diet. There are some keto approved fruits like avocados, blackberries, strawberries, lemons and limes, and more! The best part though is that you can easily find alternatives or I can do it for you. Read on for super delicious and oh-so-decadent desserts that will satisfy your sweet tooth without knocking you out of ketosis. Satisfy That Keto Sweet Tooth! Now that you’re armed with 20 amazing keto recipes, you can continue to lose weight and enjoy the sweet things in life. Even if you aren’t doing keto, you can enjoy some really delicious desserts regardless. If you’re looking for more recipe inspiration, check out our recipe section. I don’t know about you but, keto seems the way to go to achieve your health goals. For me, I know that it works and now, I can still get my sweet tooth on! I know that I am bookmarking them all to make it when it strikes! I think the first thing I am going to try is the low-carb butter pecan cookies because umm, YUM? The keto blondies too? Oh, my word! I’m also tempted by the Keto Lemon Bars too, I’m a sucker for those. Heck, who am I kidding? I want to try them all! Do you have a keto-friendly fave dessert? What a great list! I bookmarked it for future reference. I am already dying to try all of these. I miss my sweets. Yes, I have a big sweet tooth. All of these treats look really good and yummy. I have never made kepo recipes but everyone seems to be jumping on the keto bandwagon. Will check out the ingredients. Yum, I would want to try all of these! They all look delicious. I love chocolate. And lemon bars! I have a big sweet tooth. I have several friends who have had great success with the Keto diet. I’ve been thinking about trying it myself. These look like great recipes to try. Yes, hope you find one you like! I have been experimenting with keto recipes. I love this list of keto desserts. It’s possible to have delicious treats that are still compliant! I would love some of those pecan cookies, they look so good! Thanks for providing the links to the recipes, I will check some of them out. Although I don’t do KETO I am gluten and dairy free. Will go through the recipes and look, since there has to be something that I can adapt to my lifestyle. Yes, you can always adapt them. All of those desserts look so good. Lemon Bars are one of my favorites. My did a keto diet a few months ago and he did not have any good desserts. These look amazing, pinning them for later. Yum, they all sound delicious. I am not keto but I do enjoy some of the recipes so I will have to take a look at these and pick some to make! All of these recipes look amazing. I’ve always thought about going on the Keto diet too. I may need to look in to it more. Either way, I’d love to try many of these recipes. Yes, it is always best to look into it more and talk to a doctor before trying a new diet. That is great collection of Keto dessert recipes. I am going to pin it for future use. Those lemon squares have me drooling! !